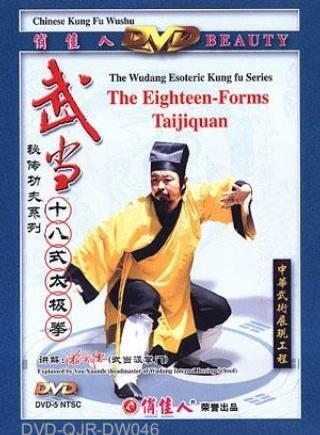 The Eighteen forms Taijiquan in Wudang boxing is new frame. In order to meet the need of national and foreign fans for Wudang boxing and to coordinate with the work the policy of "people all setting-up athletic exercises", with the support of the state athletic Wushu department, Eighteen forms has been spreaded to all over the world and formed an uniform routine in competition of Wudang that has been examined and approved by the headmaster of Wudang You xuande, which has been practiced by his disciples. The routine includes the essentials of Old Frame Taijiquan, Free Palm, Soft Palm, Five Elements Techniques for Lift Enhancement, The Form and Will Bowing and Eight Diagrams Palm. The style of these forms move well situated, tender and smooth. In the character of skills, Wudang Kungfu shows soft but against hard, power burst first though reaction backward. It is suitable to be practiced for ages of people.